Another great explorer of the great pyramid was Colonel Howard Vyse. 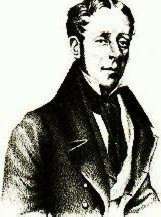 In 1836 Vyse made two important discoveries. He discovered the first and only hieroglyphics in the great pyramid. They were located in the relieving chambers above the King's chamber. They included the name of Khufu. This discovery has been questioned in modern times. His second discovery was a flat iron plate, 12' by 4' and 1/8' thick. This plate was removed from a joint in the masonry at the place where the southern airshaft of the king's chamber exits to the outside. Experts conclude that it was left in the joint during the building of the pyramid and could not have been inserted afterwards. This is highly significant since the date for the iron age in Egypt is around 650 BC. and the accepted date for the building of the great pyramid is 2600 BC. This find could significantly change history and the date of the iron age from 650 BC. to about 2600 BC. Colonel Vyse also proved that the airshaft openings in the King's Chamber led to the outside of the pyramid. The story is as follows. One of Colonel Vyse's assistants, Mr. Hill, climbed up on the outer surface of the pyramid and found similar openings where the airshafts exited to the outside. A man named, Perring, one of Colonel Vyse's engineers was in the King's Chamber at the time. Hill, at the outside of the airshaft, by accident dislodged a stone which came down the 200 feet long airshaft at high speed and came crashing through, almost decapitating Perring. When the airshafts were cleaned and opened, cool air immediately entered the King's Chamber. Since that time, the King's Chamber has always maintained a constant comfortable temperature of 68 degrees, no matter what the outside temperature was. This seems to be one of the earliest forms of air conditioning. In 1881 W. M. Flinders Petrie, did a survey of the pyramids on the Giza plateau. He measured separately all the 203 masonry courses of the great pyramid. He also did accurate measurements of the interior passages and chambers. He had the benefit of the most up to date equipment at that time.